As a female veteran as well as being the mother to two children with special needs, I find it hard to connect with the world around me. I can’t relate to that many people anymore. To bridge the gap, I started attending a talk-therapy support group once a week to socialize with other adults and to learn healthy coping mechanisms. I cannot convey with words how wonderful it feels to be able to sit in a room and not feel like an object of pity. 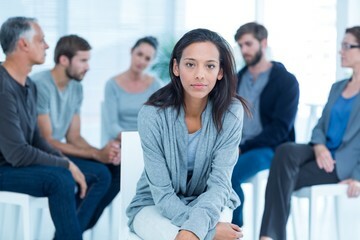 Every person that goes to the support group is there for the same reason, which is, we are each fighting some inner demon or trying to cope with the hand that we have been dealt in life; we are just tired of doing it on our own. It is refreshing to be able to have a legitimate conversation with someone that isn’t based upon superficial topics or only ankle deep in depth. Instead, those listening want to hear how I am honestly doing. Through our talks, I have discovered that hard is hard. What I mean is, that just because my problems differ from the guy sitting next to me, or maybe we suffer from some of the same issues too, whatever they may be (i.e., PTSD, sexual assault, psychological trauma associated with child abuse, domestic abuse, divorce, anxiety, depression, bipolar, etc.) it doesn’t make his or my problems any more or any less extreme than the other person’s. Does that make sense? The point is that we are both at our max capacities for what we can endure, so that makes us EQUAL in regards to being overwhelmed. We are the same in our suffering. That was a revelation to me! Group therapy has also made me feel less alone in this world. When I walk in the door and take my seat at the beginning of each session, I do not feel like an outcast. Instead, I finally feel like I’ve found a place where I can “belong.” I look at the faces around me, and I see acceptance staring back at me, despite my many character flaws. I love listening to people talk about a variety of real-life issues and them reciprocating in kind when I have something important to share that is weighing on my heart and mind. For instance, like dealing with the ups and downs of having a terminally ill and handicapped child. My son’s disorder can be off-putting to most people because the common misconception is that children aren’t supposed to get sick. I believe that is why people, in general, don’t know how to respond or act around me & my child when they see his wheelchair or learn about his disability. I have also been told that it’s not “natural” for a parent to outlive their child. Unfortunately, that line of thinking doesn’t promote acceptance, compassion, or inclusiveness but instead, it makes people uncomfortable because they do not want to be inconvenienced by the sadness that such a circumstance draws out within themselves. Thankfully group therapy has offered me the type of support as well as welcome that society as a whole hasn’t been able to. Maybe it is the setting? There is a comfort to be found in a room full of unknown individuals who don’t expect anything from one another other than an hour of each other’s time once a week. There is also a joy to be found in having complete freedom to speak your mind because you do not need to restrain yourself from saying what you want to say out of fear of hurting people like your parents, spouse, friends, etc. because they aren’t in attendance. That makes it so that honest feedback is readily available, but so are unfiltered words of comfort. Regardless of the reason, it is a relief to have a place to go to where I feel that it is safe to let my guard down and where I am allowed be the broken hot mess that I am. I said all that to say this, I don’t know the struggles that everyone is going through, but I do know that this life is tough. Problems will inevitably arise but do not carry your burdens alone if you do not have to. There are resources like group therapy out there if you feel like you can’t turn to your family or friends for aid in your darkest hours of need. It has been my experience that sometimes a kind word from a stranger or simply knowing that someone (ANYONE) cares what you are going through can have the power to get you through a crisis. Thus, do not be afraid to ask for help. It takes a lot of courage to make yourself vulnerable by opening up and admitting that you are not okay.